SharePoint Et Cetera...: Picture Library Flyout Menu - gone?? Picture Library Flyout Menu - gone?? 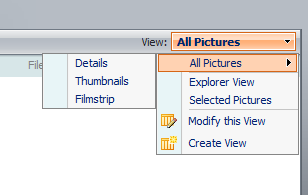 Recently, on site I had an end-user complain that the Views flyout menu shown below has disappeared. It appears, by default in a standard sharepoint picture library in both WSS and MOSS. On investigation, it seems that the Infrastructure Update released by Microsoft in July somehow breaks it. Theres currently no fix available so watch this space! I'll post back when I find out some more.